SPREADSHEETS are notoriously difficult to validate. Undetected errors have caused large financial losses and expensive litigation. The Spreadsheet Detective helps ensure model correctness in Microsoft® Excel® by providing automated documentation that highlights mistakes. The tool received a 5 Star (top) rating from ZD Net. See the big picture with a comprehensive workbook report, data flow analysis and error detection. Show which cells have formulas and how they have been copied throughout a model. Clarify cryptic "A1" references using English AutoNames. Non modal window constantly describes the current formula. Easily follow complex Workbook Precedent/Dependent relationships. Compare different copies of a spreadsheet. Manage Scenarios, and perform Monte Carlo simulations. 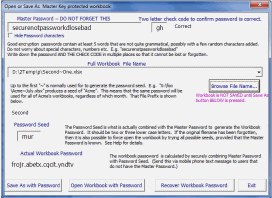 Encrypt sensitive workbooks without any risk of losing the password. Assist with the understanding and manipulation of Named Ranges. In combination these clarify the structure of complex models. They go well beyond Excel's in built auditing features. "Spreadsheet Detective is one of the longest established and most comprehensive suites of auditing tools that we have seen. This is not to say that other products may not have features that are not in Spreadsheet Detective or that, in some instances, we might prefer a competitor’s implementation of a particular feature but, overall, the product is clearly the market leader, and deservedly so." The Compliance Detective can record meta data about spreadsheet models that document their risk profile. It can then produce company wide reports of the models, their risk profile, when they had formulas (as opposed to data) changed. Rules can be provided as to when formal reviews are required, and the tool can then track who has reviewed them. The Compliance Detective can quickly scan large repositories such as Box.com, and does not require any web interfaces. It has been used effectively by a large financial services company that has thousands of spreadsheet analysts. "Perform an on line search for spreadsheet errors or spreadsheet audit, and you will find a number of major failures attributed to spreadsheet inaccuracies that hit the press in the past year alone." The Detective is priced very reasonably as can be seen on the Price List. There is also a Free Download available. Excel versions are supported from Excel 2016 down to Excel 2007. Please direct any questions to the email below. 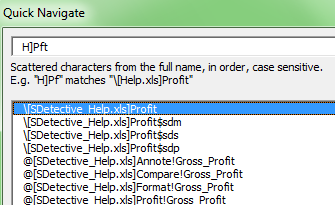 The Spreadsheet Detective is an essential tool when auditing Excel spreadsheets. Provides a bird's eye view of complex models by summarizing each worksheet, highlighting potential error conditions, showing data flow between each worksheet, references to external workbooks etc. Cell shading clearly shows which cells have formulas, and how they have (or have not!) been copied throughout a spreadsheet. New bold shading highlights inconsistent formulas on larger models. And the shading is right on the actual model, so that it can be seen while the model is being developed. This information can also be shown on a condensed map report. Symbols show how formulas have been copied, and comments show the original formulas. The blue, yellow and red background colors indicate potential errors and issues that have been automatically detected. Shows the active cell's formula with "English" AutoNames that clarify the meanings of the cryptic A1 references. So the cryptic reference $E$26 below can be described with the AutoName InterestOnCapital. AutoNames are based on cell labels, so that unlike conventional named ranges they are always up to date as a spreadsheet model evolves. The dialog is non-modal so it can be constantly displayed to help you while you edit the underlying model. Hyperlinks make it easy navigate to precedents. But more importantly AutoNames let you understand what most A1 references mean without needing to navigate to the precedent cell. This can also be displayed more fully as a task pane. 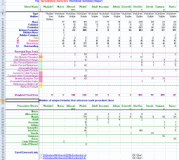 Provides a complete list of all distinct formulas and named ranges. AutoNames clarify cryptic A1 references. Consider different scenarios or perform full Monte Carlo simulations. Manage uncertainty and avoid the flaw of averages. Completely describes a model by annotating the spreadsheet itself. 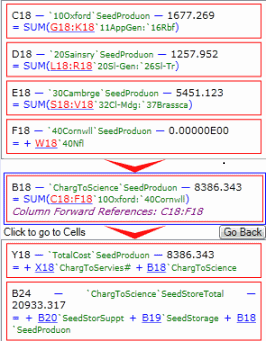 Clearly shows changes between different versions of a model even if rows or columns have been inserted or deleted. Unifies changed copies of a formula in the optional report. Shows which parts of complex formulas have changed. Can also compare different parts of the same worksheet. Quickly navigate to worksheets or named ranges by just typing a few characters from their name. You know you should encrypt your extremely sensitive workbooks, but what if you lose the password? Master key encryption makes protecting your data practical. 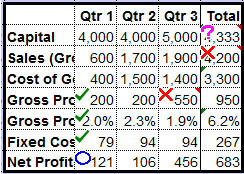 Provide a detailed outline report to see where values is comming from and where they are going. Discover where your spreadsheet models are, and what other models link to them. Obtain a new perspective by examining each formula's sensitivity. View and edit named ranges, easily verifiy their definitions and automatically update the formulas that use them. Extra Keywords: Excel Auditing Spreadsheet Errors Financial Models Add In Audit Addin SDetective SDetective_Library SDetective_TheAddIn SDetective_Order SDetective_Help Professional Oak Detective Financial Audit Operis excel savvy spreadsheetadvantage Auditing EXChecker Auditor Red Incisive Advantage Rainbow Space Excel Error AddIn Add-In tool xlspell Operis Space Analyst Rover 21 CFR Part 11 and Sarbanes-Oxley, validator validating spreadsheet auditing tools.